Following a parliamentary Act of 1703, Dublin's first House of Industry was established on a site to the south of the River Liffey near (Saint) James's Street. Although the establishment's inmates included 'sturdy beggars', 'disorderly women', and the old and infirm, its main activity became that of the city's Foundling Hospital, receiving large numbers of orphaned or abandoned children. For such idle, strolling, and disorderly women as should be committed and found able or fit for labour. The Talbot Dispensary which provided medical and surgical relief to the extreme poor of the north-west quarter of the city, numbering over 300 a week. In the 1790s, the workhouse was issuing its own copper coinage, the reason for which is unclear. One possibility is that it was issued as "pocket money" to inmates in return for their labour, with restrictions on how or where it could be spent. A House of Industry token, c.1795. "Curable" lunatics, on the other hand, might be placed in the Richmond Lunatic Asylum, immediately adjacent to the House of Industry, opened in 1814. This institution provided treatment for pauper lunatics from throughout the country. Co. Dublin: North City (18), Howth (2), Blanchardstown, Castleknock (2), Clontarf (2), Coolock (2), Drumcondra (2), Finglas (2), Glasnevin (2). The Board also included 11 ex-officio Guardians, making a total of 44. The population falling within the Union at the 1831 census had been 124,425 with Divisions ranging in size from Blanchardstown (population 1910) to North City (100,273). The part of Dublin to the south of the River Liffey formed the separate South Dublin Poor Law Union. 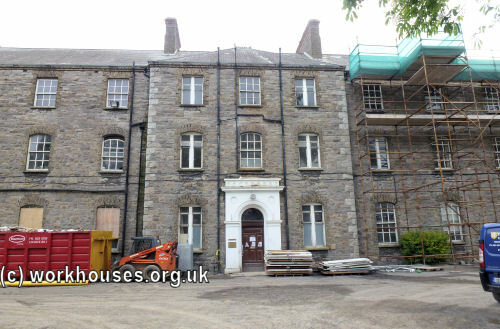 Pauper lunatics were not to be accommodated in the Union workhouse and 370 transferred from the existing premises to former artillery barracks at Island Bridge. 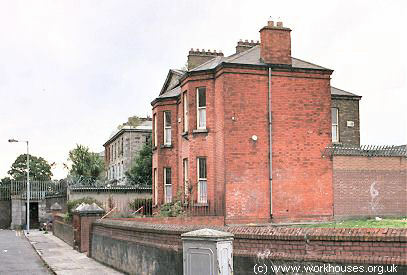 North Dublin workhouse site, 1849. Apart from some additions at the north, the site was relatively unchanged sixty years later as shown on the 1907 map below. North Dublin workhouse site, 1907. The food and clothing within an Irish workhouse is certainly better than the pauper could enjoy out of it, for of course the inmates of such a house are not allowed to go about half-naked and half-starved, the usual condition of the poor in Ireland. The food consists generally of potatoes, oatmeal, and milk, particularly buttermilk. Bread is given only to the children and the sick. The diet tables and other regulations of public institutions are of interest to the inquiring traveller, for they often afford him a convenient insight into the manner of life of a whole nation. When, therefore, I detail to my readers the fare of a pauper in an Irish workhouse, I give them a picture of the style of living of the great mass of the Irish people, of those at least among them who have it in their power to eat their daily fill. As among most classes in Ireland and England, the day is divided into three acts or meals, breakfast, lunch, and dinner. By the last is not to be understood the noonday meal, but the chief meal of the day. The lunch is participated in only by the children and invalids. The healthy and full-grown are excluded from it. The hours at which these meals are taken are later than with us in Germany. Nine o'clock is the hour for breakfast, and four in the afternoon for dinner. The breakfast, as in most parts of Ireland, among those who have the means of decent maintenance, consists of new milk and stirabout, a kind of porridge of oatmeal; the dinner is composed of potatoes and buttermilk. The children, for their lunch, receive bread and milk. On Sundays, holidays, and on every Thursday, a little brose, or soup, is given, in addition to the customary diet. An adult receives seven ounces of oatmeal and half a pint of new milk for breakfast, and four pounds of potatoes and a pint of buttermilk for dinner. The board of an adult is calculated to cost one shilling and fourpence three-farthings weekly. That of the children is more expensive, on account of the bread, and the more liberal supply of milk. The most costly of all is the board of the children under two years old, who cost one shilling and sixpence three-farthings a week, for which they receive one pint of new milk and a pound of bread daily. There is therefore a potato diet for adults, a bread diet for children, a rice and meat diet for the sick, and lastly, a fever diet for the class of patients always most numerous in an Irish workhouse. I was astonished by the appearance of the potato-kettle at this house. No less than 1670 pounds of potatoes are boiled at once. This enormous quantity is all divided into portions of three and a half and four pounds, and each portion is enclosed in a small net. All these nets are laid together in a large basket, and this basket, with its nets and potatoes, is deposited in the boiler. When the potatoes are supposed to have been sufficiently boiled, the basket is wound up again by a machinery, constructed for the purpose, and the poor are then marched up in military order, when each receives his net and marches away with it. In the school, belonging to this house, the Chinese-Russian calculating board, or numerical frame, had already been introduced, but only a fortnight before my arrival. Most of the people were employed picking oakum, the occupation assigned to the inmates of most of the prisons and workhouses of England, who are thus made to prepare lint for the wounds of the British men of war. This article is indispensable in the dockyards, where it is used for calking ships. Hundreds of thousands of hands are daily occupied in the workhouses, and houses of correction, in untwining old rope ends for this purpose. One of the most interesting parts of the establishment is the old clothes store, in which the variegated rags that the paupers bring with them are carefully preserved, to be returned to them on their departure. A pauper, on entering the house, receives in exchange for his motley drapery, the gray uniform of the house, with N.D.U.W.H. 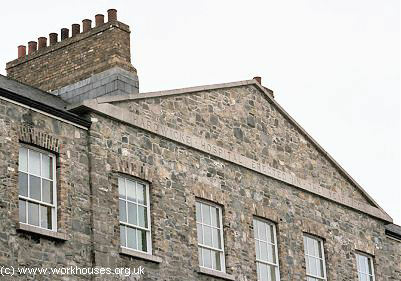 (North Dublin Union Workhouse) embroidered upon it in large letters. His liberty rags, together with hat, stockings, shoes, &c., are first carefully fumigated, and then, having been folded together, are marked with the name of their owner, and. deposited in the old clothes store. The pauper may at any time have his discharge, by simply intimating a wish to that effect to the governor, but to allow him to take with him the clothes worn in the workhouse would never do, or many would enter one day and go away again the next, merely for the sake of a new suit of apparel. Their old rags are therefore restored to them, and their ingenuity is again. taxed to discover the right entrance to their distorted sleeves. It happens almost every day that among the 2000 inmates of the house, one or other, weary of discipline and confinement, and longing for his former liberty, gives the governor notice to quit, and demands the restitution of his wardrobe. It so happened that, at the period of my visit, such an application had just been made, and the clothes store was, in consequence, open. All the theatres in Europe could not have matched, in point of variety, the wardrobe here displayed to me. In 1895, the workhouse was visited by a "commission" from the British Medical Journal investigating conditions in Irish workhouse infirmaries. Their report noted that North Dublin had separate infirmaries for Roman Catholic and Protestant patients, the former being staffed by nuns who had received no formal medical training, and with a large number pauper inmates acting as nursing assistants. As well as the lack of trained nurses, the report criticised the state of the patients' accommodation — the female luntaics were said to be housed "in quarters better fitted for animals than for human beings." Further details are available in the full report. The BMJ's revelations contributed to the introduction of significant improvements in the standard of Irish workhouse nursing, with the employment of pauper inmates ending ending after the passing of 1898 Local Government Act. In 1918, the North Dublin union was amalgamated with South Dublin, the joint union being named the Dublin Union and based at the former South Dublin site. 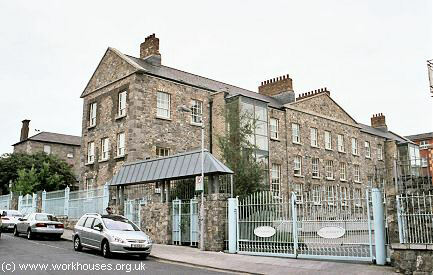 The old North Dublin workhouse was then taken over for military use. 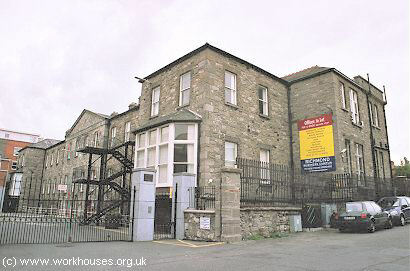 The main workhouse building has now been demolished apart from two small buildings at the southern entrance to the site. 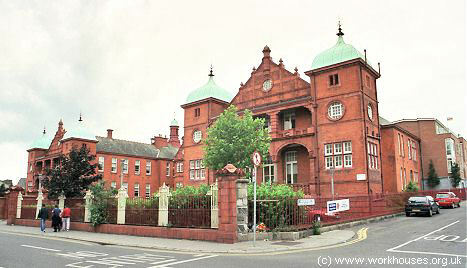 The North Dublin union operated a separate poor law school, known as St Vincent's Home, at Cabra, on the south side of the Navan Road, alongside Dublin's Phoenix Park. 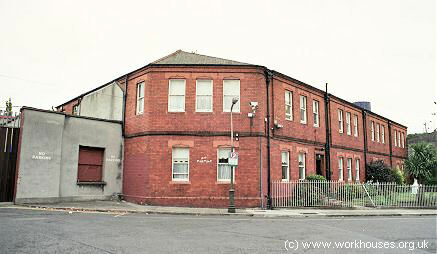 The South Dublin union's Pelletstown school stood a few hundred yards away to the north-west. In 1914, the two schools housed a total of 635 children. North Dublin workhouse school site, 1907. The site was later taken over by the Daughters of Charity as a home for 'mentally defective' girls and small boys. In 2014, the building was being refurbished for new occupants. Former North Dublin Union St Vincent's School, 2014. 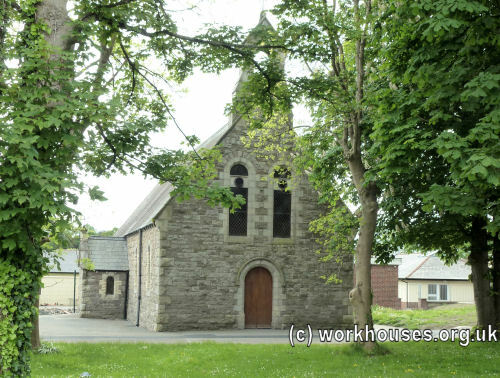 Former North Dublin Union St Vincent's School chapel, 2014. 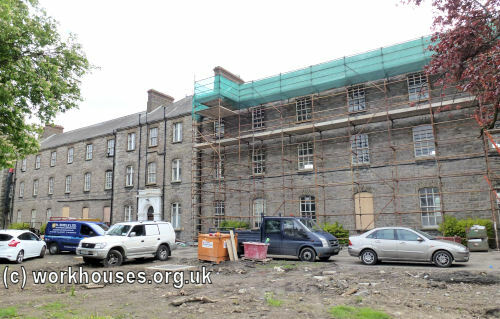 The North Dublin workhouse admission/discharge registers are now searchable online on findmypast.ie (subscription required). Corrigan, Frank (1976) Dublin Workhouses During the Great Famine (Dublin Historical Record, XXIX, No. 2, 59-65.